Taste of Music City and Savor Nashville Celebrity Chef Dinner! So, what better way to experience Nashville’s food than by tasting all that it has to offer, right? This is going to be one foodie packed weekend! Buy yourself some tasting tickets and enjoy foods from some great restaurants like tayst, Martin’s BBQ Joint, Copper Kettle, MafiaOzas, and the Boundry. Did I mention proceeds benefit the Martha O’Bryan Foundation? Eat and benefit a good cause! *Kickoff Event: June 3, 2011, 5pm-8pm at Public Square Park. $25 ticket for a preview with local breweries! This is the event I’m most excited about! There are five, yes 5!, James Beard Award winning chefs coming to town. They are pairing up with 5 amazing Nashville local chefs and putting on a dinner with wine pairings! Here is a look at all the chefs and the amazing menu. Go to the website to purchase tickets. *Thanks to Beth for the heads up, but there is a limited time deal going on where you can get $55 of the ticket price. Click here! And as if you couldn’t pack any more food in, a bunch of amazing local chefs are making one of my favorite dishes – shrimp n’ grits. Who am I to resist 10 or so offerings of this magnificent combination? Guess what, you’ll get a mimosa there too and get to try all the dishes! Tickets for this event are $40. Enter the Taste of Music City Kickoff Event Giveaway!! *NOTE: CONTEST IS CLOSED. Kelly Randall was the winner! Next week should be an amazing and exciting weekend for the Nashville food scene! So if you are in town or up for a road trip, come on down here next week and engage in some glorious gluttony for the weekend. 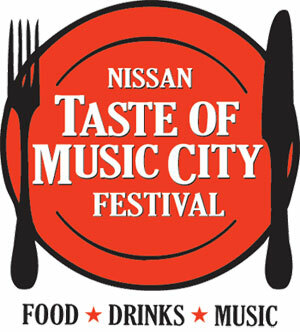 To help you kick it off, I am giving away TWO tickets to the Taste of Music City KICKOFF event on June 3. In order to enter, leave a comment telling me about your favorite restaurant/dish in Nashville. I will randomly pick a winner next Wednesday (June 1). I can’t wait and I hope to see you there! My favorite restaurant of all time in Nashville was Zola, and pretty much anything Deb Paquette made there. Since Zola closed, I’ve been auditioning new favorites. Right now I probably go to Amerigo more than anywhere else. I love pretty much everything on their menu, but I always have to get their crab cake, especially during their early bird special! I’m not sure if this counts as a restaurant, but I am in love with Pinkberry! I am also going to Cha Chah’s in a couple of weeks. Your pictures and review sealed the deal! Ooh this is so hard to pick!! I love the belly ham pizza at city house. ooh, great giveaway, vivek! my favorite restaurant in nashville might be watermark these days. although those addicting ravioli sticks at mafiaoza’s might be my favorite food of the moment. i can’t get them out of my mind!! Don’t know if I have a favorite restaurant or dish, but the braised chicken at Firefly Grille is outstanding. I think it is only on their winter menu and it is a perfect winter meal. I have two favorites, first would be the Falooda at Woodlands, and second would be the bread pudding at Arnold’s. I would have to say that my favorite restaurants are a pretty solid tie between City House and Miel. If only I could frequent them more often… good news is our 1st wedding anniversary is coming up soon and I am willing to bet the farm that I will get to eat at at least one of them! My favorite restaurant in Nashville is the Yellow porch and I can not get enough of their shrimp & grits. It is just about perfect & if on the menu, I get it every time! 55 south & Mack & Kate’s both have excellent shrimp & grits as well. i’ve only lived in Nashville for two months, but I recently made it over to East Nashville and ate at a food truck called Terra Delicious. It was absolutely amazing and is so far the best place I’ve eaten. The flatbread sandwich I had was perfect!